Sobremesa Chicago, a staple in the Chicago underground dining scene, announces the arrival of their very own hot sauce: Ají Sobremesa. After a successful crowdfunding campaign in 2016 raising over $30,000, Ají Sobremesa is now a reality. It is currently available across various retail locations in Chicago (Local Foods, Green Grocer, Publican Quality Meats, Belli’s, Smack Dab, Cellar Door Provisions, Foodsmart, Sugar Beet Food Co-op, Kimski) and ready to change the color and flavor of the $1 billion hot sauce industry. 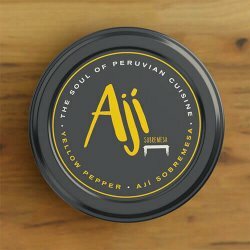 Ají Sobremesa is a versatile, flavorful hot sauce made with “Ají Amarillo” or Peruvian yellow peppers. Ají Amarillo is the foundation of Peruvian cuisine, an ingredient in every ceviche, a flavor agent in traditional dishes like Lomo Saltado, and a source of inspiration for many wonderful sauces found across Perú. Beyond its Peruvian roots, Ají Sobremesa is unlike any other hot sauce available in the market. At first glance, its radiant, golden yellow hue breaks from the convention of a category dominated by green and red sauces. Once attracted by its unique color, people will find the most versatile hot sauce in the market. Its citrusy hot, but not too hot, flavor makes it pair with almost everything. 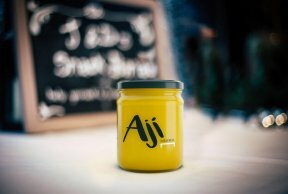 Ají Sobremesa can be used as an ingredient while cooking, a dipping sauce for veggies or chips, a base for spicy aioli, or as an added kick of spice for any dish. Flavorful, unique, and versatile Ají Sobremesa is also completely natural, has no preservatives, and is non-GMO. Basically, it looks good, tastes good, and is good. Sobremesa Chicago is a food project born in 2012 in the Pilsen neighborhood. Founded by three childhood friends from Puerto Rico, Sobremesa’s vision is to build community and break down barriers through food.